Below is a map of the wide range of locations where we are able to offer quality serviced accommodation throughout the United Kingdom. Citystay have specially selected the locations to service the major business hubs across the globe. We also offer a wide range of locations throughout the world including the EMEA, the Americas & the Asia Pacific regions. Citystay work in partnership with Homely Serviced Apartments to provide quality serviced accommodation in the Sheffield Area. Homely Serviced Apartments share the same ideals and values as Citystay when it comes to delivering a quality service. Below is a map of the wide range of locations where we are able to offer quality serviced accommodation throughout the Europe, Middle East & Africa region. We also offer a wide range of locations throughout the world including the United Kingdom, the Americas & the Asia Pacific regions. We offer accommodation in many more locations so please do not hesitate to contact the Citystay Global Apartment Network if your required location is not listed on the map above. Below is a map of the wide range of locations where we are able to offer quality serviced accommodation throughout the Americas region. We also offer a wide range of locations throughout the world including the United Kingdom, EMEA & the Asia Pacific regions. Below is a map of the wide range of locations where we are able to offer quality serviced accommodation throughout the Asia Pacific region. We also offer a wide range of locations throughout the world including the United Kingdom, EMEA & the Americas regions. The Citystay Global Apartment Network is the new one-stop service for all your temporary accommodation requirements designed to save you time, money and effort whether you are an accommodation booker for your company, an independent business traveller or corporate travel manager. Citystay Serviced Apartments in Cambridge has, since inception, developed a cherished reputation as being one of the leading providers of corporate accommodation. As well as operating our own portfolio of quality accredited luxury serviced accommodation, we now represent a global network of apartments through our carefully selected partners. We can therefore offer an exceptional choice of apartments, not just in Cambridge but across key global locations.The apartment’s we now offer across the globe have been hand selected by our knowledgeable team based on their quality, location and amenities. It is this market expertise that enables us to deliver the right solution for you and your business based on your requirements in terms of budget, quality and location. for their temporary accommodation requirements. As a company we pride ourselves on delivering award winning customer service. 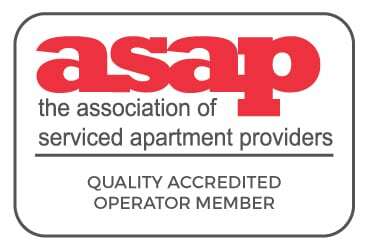 We are members of the Association of Serviced Apartment Providers (A.S.A.P.) and adhere to their code of conduct and quality guidelines. Our global apartment network services team are therefore well placed to provide guidance, information and support. What the Citystay Global Apartment Network can offer you. Simplicity: The Citystay Global Network offers a one-stop solution for all your temporary accommodation requirements, therefore eliminating the difficulties and reducing the time consuming process of working across several global networks. Award Winning Service: Citystay are proud of our award winning customer service. We focus on what is important to you. Customer led, we ensure that your internal policies, budget and expectations are met. The Citystay Global Network strive to continually improve our service to meet your requirements. Locations: The strong, and strategic partnerships that we have in place across the globe are in selected central locations designed to service major international business hubs. Flexibility: The Citystay Global Network are eager to understand your specific requirements in order to tailor our services accordingly. Our team are on hand to make sure that global markets are accessible around the clock to ensure a speedy response to all enquiries. Knowledge: Citystay have consistently achieved the highest classification of ‘outstanding’ by the industry’s assessing body, the A.S.A.P. and thus we are among the higher echelons of corporate housing providers globally. It is this industry expertise that makes us exceptionally well placed to help you source the best apartment to meet your needs in terms of budget, quality and location. Quality: Our portfolio of apartments in Cambridge has achieved a reputation, and been award for, quality in terms of locations, furnishings and customer service. Our selective approach to choosing the apartments we offer globally help to ensure the delivery of quality to our customers. By working closely with you to assess and understand your accommodation requirements, the Citystay Global Apartment Network are able to implement the best structure to suit your needs. In shaping the structure of how we operate around your requirements we are able to manage both the guest and booker journeys from initial enquiry through to check out including all guest communications and invoicing procedures. Once you have chosen your preferred apartment from the choice of our hand picked selection, the Citystay Global Apartment Network will ensure that the guest receives all the necessary information regarding the apartment including the check-in procedures, guest services options and cancellation policy. From here, the Citystay Global Apartment Network would then supply all the necessary financial documentation and relevant payment terms to the correct department. Enquiries can be made directly with our team by phone or email and typically we guarantee a speedy response and offer, where possible, a choice from our selected global network of apartments. The Citystay Global Apartment Network team will also ensure that bookers or management are able to evaluate and report on any key information which is required. To discover more about how the Citystay Global Network is able to deliver a tailored, flexible and cost effective solution for your global serviced accommodation requirements, contact us today on +44(0)1223 420920 or email us at global@citystayuk.com. Click here for our full Global Apartment Network Terms & Conditions.